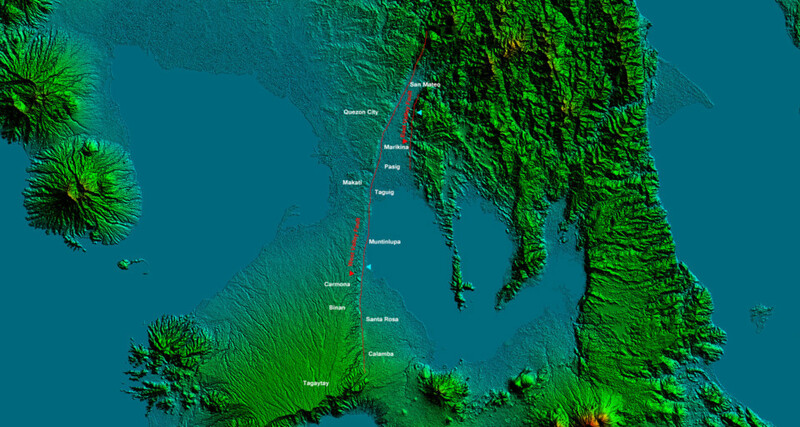 ﻿ Could Ring of Fire activity trigger The Big One quake in Manila? 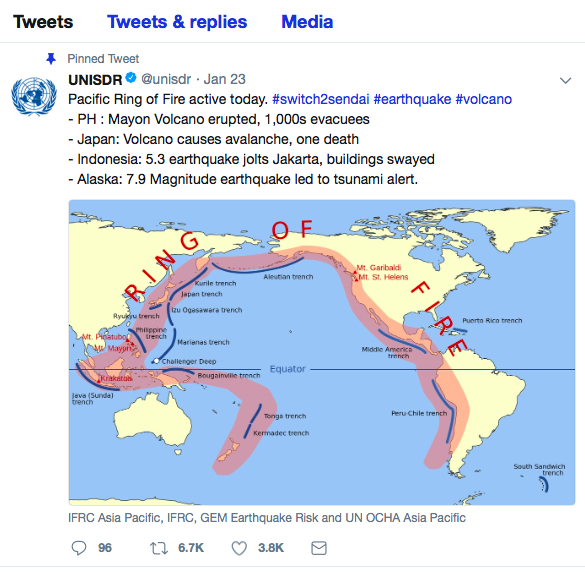 A United Nations warning that the Pacific Ring of fire is unusually active has stoked fears that Manila could be hit by The Big One earthquake. The UN’s Office for Disaster Risk Reduction has shared a tweet highlighting the alarming number of recent volcanic eruptions and earthquakes. It noted the 6.0-magnitude quake that struck Java, Indonesia; the ongoing eruption of Mayon Volcano; the eruption of Kusatsu-Shirane volcano in Japan; and the 7.9-magnitude quake that prompted tsunami alerts in the US West Coast and western Canada. 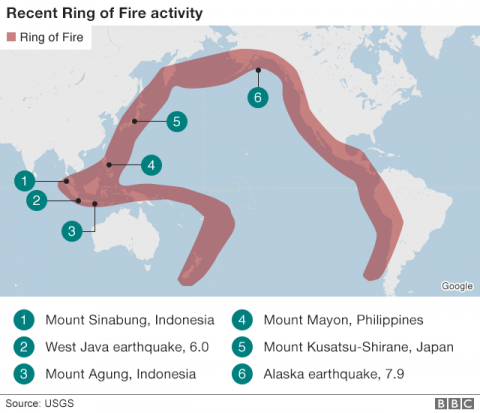 The Ring of Fire refers to a string of volcanoes, earthquake sites and tectonic plates around the Pacific. It spreads across 25,000 miles from the southern tip of South America all the way round to New Zealand. About 90 per cent of all earthquakes occur along the area and the ring is dotted with 75 per cent of all active volcanoes on Earth. Last year we reported on concerns expressed by the Philippine Institute of Vulcanology and Seismology (Phivolcs) about possible movements on the West Valley Fault, which runs beneath Manila. Phivolcs director Renato Solidum has long been warning that the West Valley Fault is overripe for dramatic activity. The fault, he said, tends to move every 400 years or so. Its last major quake was in 1658 — or 357 years ago. The path of the West Valley Fault. A 2004 study demonstrated how a magnitude 7.2 quake could kill up to 34,000 people and injure untold others, while causing calamitous damage to buildings and infrastructure. The current increase in Ring of Fire activity can only heighten fears that such an event has grown more likely. However, some scientists argue that the recent activity is nothing to worry about. Professor Chris Elders, a geology expert from Curtin University in Australia, told the BBC that recent events were entirely normal. Dr Janine Krippner, a New Zealand volcanologist based in the US agreed, tweeting that the zone was “not referred to as the Ring of Fire because it sits there doing nothing”. In its latest bulletin on Mayon volcano today, Phivolcs has continued to report episodes of “intense but sporadic lava fountaining”. The National Disaster Risk Reduction and Management Council has reported that 14,483 affected families have now been moved to 59 evacuation centres.